We Don’t Dwell on Anger. We Act. 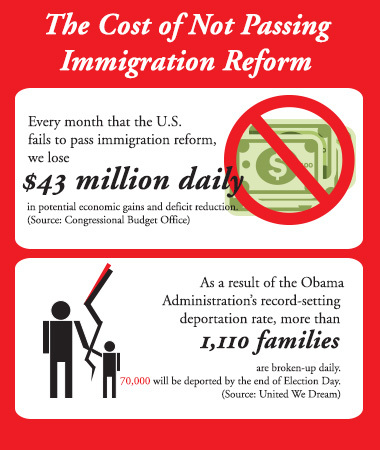 LULAC Members, Take Action in Support of Immigration Reform. The President’s decision to delay executive action on immigration reform for political convenience leaves 11 million people in the shadows. Such a delay is not without harm. The Latino community fully understands that every day action on immigration reform is delayed, families are hurt, and our economic recovery is diminished. There is no question but that sound public policy supports comprehensive immigration reform, and we must continue to fight to make that happen. The data for supporting immigration reform is strong. Specifically, according to the Congressional Budget Office (CBO), immigration reform would decrease the federal budget deficits by $158 billion over 2014-2023 and by $685 billion over 2024–2033. It would also boost economic output and increase GDP by 3.3 percent in 2023 and by 5.4 percent in 2033. Congress’s failure to pass immigration reform, has cost the American people $15.8 billion a year, $1.3 billion a month, or $43 million a day- in potential economic gains/deficit reduction. In the wake of yet another politically calculated move, Latinos are being treated as if they are pawns in a chess game. Such delays demonstrate that politicians care more about their political future than they do about the immigrant community. As a result, without valid substantive reason for delay, Latinos are once again being told to wait their turn. Our community cannot stand idly by and put our hopes in such an unfair process. We must harness our disappointment and anger into action that demonstrates the power of our collective voice and shows our electoral strength. LULAC calls on its membership to act and demonstrate that it will not take no for an answer. The following is a list of specific action items that can make a difference. Register to vote & vote! The midterm elections will be on Tuesday, November 4, 2014. Make sure you are registered and you turn out to vote! 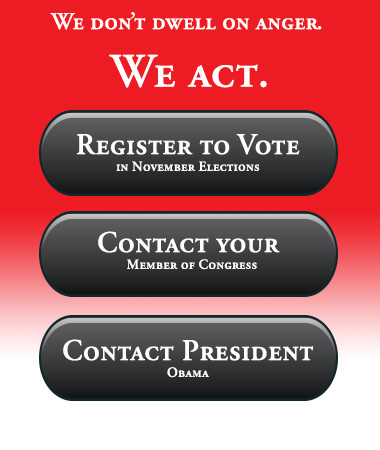 To register to vote online, click here. Send a Letter to your Representative.